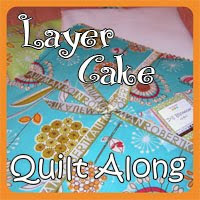 Today I decided to start pulling fabric for a replacement quilt. 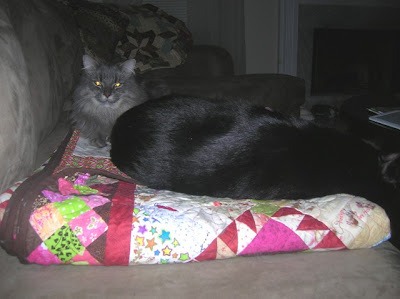 10 years ago, I made a quilt for my friend Kathy's daughter and son-in-law. Kathy told me recently that it is looking a little ragged. I have been cutting purple today-lots of purple. When I took a break, I counted the squares already cut-would you believe I have 61 different purples? Has anyone else accumulated that many purple fabrics? There are probably a few more that had not made it to the purple pile. I heard today that the "state" was in for annual survey at the old workplace. Sorry I missed them..not! Nice not to have to worry about when they would blow in. I have been away from the blogging scene since I am so frustrated with not being able to post pictures. I treid again tonight and still it won't work. I am loving retirement. I have not as yet followed throu with my intention of cleaning. It just has not happened. I have made myself a routine of water aerobics and walking. I am trying not to nap too much!! This past weekend was Thimbles. I got to go to Friday day session for the first time. I also wnet to Saturday. 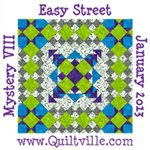 I worked on step three of the mystery quilt. Lots of teeny nine patches. I finished them today. I also started on a new kit called Second Hand Clothes- a red crinoline (Bonnie Blue) pattern. I am loving that too. I finished this great bag. I wish I could post a picture of it. I love it. It goes with me to water aerobics. Do I miss work? Not hardly-not even-not ever! I am having trouble posting again. I trued severak tunes yesterday, No luck. (not that anything newsworthy is happening)! I can't believe it is Friday. And I know it is Friday because the tv says so! And it is June 1-I looked at the calendar! What has been accomplished this week? Not much!! I did get dressed (most of the week). Bonnie Hunter new book is previewed on her blog. 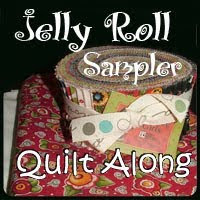 Even though I have already made 2 of the quilts in the book Orca and Roll. roll ( Spooky's new fav. 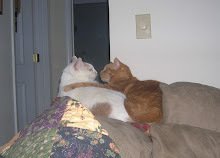 He is barely tolerating sharing it with Willie as seen in the picture. Can imagine what he is thinking.) I feel I NEED this book. It is due for publishing in July.